Use this Video to create awareness http://www.youtube.com/watch?v=VhdfxHnJAl0&feature=youtu.be and then encourage signing The Social Protection Campaign. The links to the petition are provided here for your convenience. http://www.gopetition.com/petitions/signature-campaign-social-protection-floor.html The NGO Committee for Social Development in New York is supporing this petition. Please add your name to the petition. The aim is 1 million Signatures. Sign to day …. The panel provided a global overview of the Social Impact of the Economic Crisis based on the recently published Report on the World Social Situation 2011. This was presented by Mr Anis Chowdhury, Senior Economic Affairs Officer DESA . 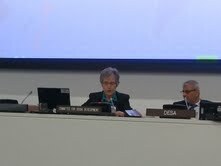 The three commentators included Mr Henk-Jan Brinkman, Chief, Policy, Planning and Application Brance Peacebuilding Support Office. Steve Miller, former senior ILO official and Secretary of the UN Secretary-General’s Youth Employment Network (YEN) and myself. 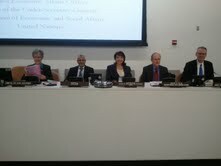 Thank you for the opportunity to speak on this panel for the launch of ‘The Global Social Crisis – Report on the World Social Situation 2011’ It is an honor to be present with you, representing the NGO Committee for Social Development and my own organization ‘The Congregation of Our Lady of Charity of the Good Shepherd’. My organization implements direct social services with vulnerable populations in 72 countries of the world. I will comment on the report, from a social work perspective and from the experiences of people living in poverty, those vulnerable to falling into poverty, the reality of women and girls, and experiences of unemployed youth. In all, I will draw on The Values Statement and Advocacy Points developed by the NGO Committee for Social Development. I am pleased that the report acknowledges the experiences of vulnerable groups and especially that the gender dimension is specifically referenced in regard to the social consequences of the experience of poverty, for example – increased rates of domestic violence, women staying longer in abusive relationships, and a reduction in the number of services provided by shelters despite rising demand. The focus on Labor migration leading to family break up – with reported increases in the incidence of child abandonment, abuse and trafficking – is a most important issue relevant to gender, Human Rights and social protection. The report further recognizes the need to address power and patriarchal structures with regard to property rights and land tenure for women. Citations in the report accurately reflect the experience of my organization in working with women and girls who are trafficked, forced to migrate and oppressed by abject poverty. The report notes that ‘economic downturns also widen the gaps between boys and girls, supporting the oft-made claim that intra household resources allocations favor boys over girls when resources are scares.’[i] ‘Efforts to improve property rights and land tenure should target women, who produce a large share of the food in most poor countries. [ii] Thus the report does a fine job of placing us in the reality and context of our current global social crisis 2011 and should be very useful. On the limiting side, while the report states accurately that economic policies considered in isolation from their social consequences can have dire consequences, the report does not adequately challenge the prevailing systems and structures that have brought about this global social crisis. New paradigms based on human rights, social justice, people participation, equitable distribution of resources and sustainable living patterns must be developed and it is disappointing not to see them highlighted. . The report does underscore the dynamic and multidimensional nature of poverty and the critical importance of social protection for reducing vulnerability. The NGO community applauds this. Countries that have social protection systems can better mitigate the negative impacts of shocks and prevent people from falling deeper into poverty. Social protection measures can also help regenerate economic activities and livelihoods. [vi] The report urges that social investment be given priority and that the global social crisis offers an opportunity to rethink the role of social policy and social investment. This cannot be undertaken in a disjointed way. The interconnectedness of the environment, social and economic dimensions of development must be recognized and acted on. Social investment must be at the center. The NGO community sees hope in the prioritizing of the social protection floor initiative and is presently engaged in a signatory campaign to promote implementation of the social protection floor initiative at national level. The implementation of the Social Protection Floor would ensure achievement of the MDG’s Goals and pioneer the way for post 2015 and the elimination of all poverty. The Social Protection Floor is a beginning, a first step towards human rights based, equitable, Universalist approach providing access to health care, education, clean water and sanitation, food, housing and other essential services together with social transfers in cash or kind, guaranteeing income security. A Social Protection floor would guarantee these rights. The final adoption of the ‘Draft Guiding Principles on Human Rights and Extreme Poverty’ would surely support the implementation of the Social Protection Floor Initiative. The NGO community strongly supports the Financial Transaction Tax (FFT) for development as an efficient means of assisting countries to achieve the MGD’s and, at the same time, implement essential elements of the Social Protection Floor Initiative. Food insecurity must be addressed. The report notes that the ‘emergence of the global food supply chain has weakened the commitments to national or local food security.’[vii] Other factors, natural catastrophes, climate change, land grabbing, bio-fuel production etc based on the goals of large profit driven corporation and agri-business has created this situation. Both an immediate and a long term response to food insecurity is required. Investment in small-scale farmers, many of whom are women, can help address the present crisis and contribute to long-term plans to assure food security. Investment in irrigation, technology transfer, transportation infrastructure, storage facilities, etc. is required. The NGO committee affirms the principle of participation so central to Copenhagen. The human person must be at the center of the development agenda. Every human person is entitled to participate in, contribute to and benefit from economic, social, cultural and political development. Too often those most affected by social policy are excluded from the discussion. I believe this report is missing a chapter. For full and effective analysis I would propose a chapter entitled ‘The voices of people living in poverty, Views, Analysis of the Situation and Proposal for change’ Structural systemic change can only come about when everybody has a voice at the table – not only the statistician, theorist, financial institutions, corporate executives and academics. We the NGO Committee no longer accept that persons living in poverty be called ‘the poor’. They are richly endowed human beings who have much to contribute to society and should be referred to as ‘people living in poverty.’ We therefore call for the full participation of those living in conditions of poverty in all social analysis in order to have the fullest and most insightful report possible. In conclusion, I think that one of the largest obstacles to the alleviation of the Global Social Crisis is the lack of political will to invest in people. The reports notes that ‘Policy adjustment to support social spending’[viii] is essential in the short term and expresses concern about the effects of ‘austerity programmes’[ix] on people living in poverty and services to them. A new mindset is essential to create a different future. A rights based approach ensuring human wellbeing, social equity, decent work, participation, shared economy and environment sustainability can no longer be treated in a disjointed fashion. The interconnectedness of people, the environment and the economy has been clearly demonstrated. Let us call forth the political will to act from a new mindset. This year’s International Day of Rural Women falls at a time of heightened awareness of the important contribution women are making to social progress. Women have been rightly recognized for their role in supporting movements for democracy, human rights and peace. Their contribution to sustainable development is equally significant. Study after study has demonstrated that rural women are pivotal to addressing hunger, malnutrition and poverty. They are the farmers and nurturers, the entrepreneurs and educators, the healers and helpers who can contribute to food security and economic growth in the world’s most remote and vulnerable settings. 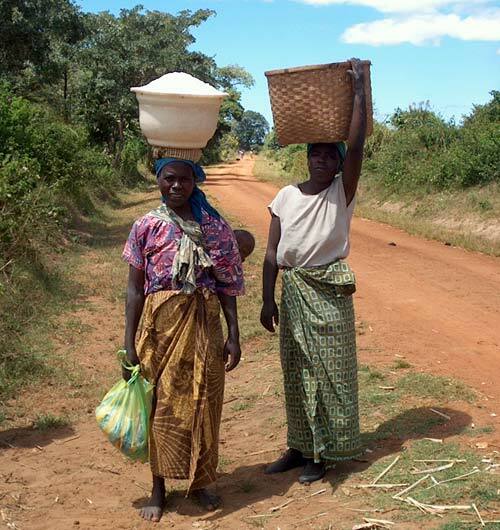 Despite the heavy responsibility rural women shoulder, they lack equal access to opportunities and resources. This hampers their advancement and holds all people back. More than 100 million people could be lifted out of poverty if rural women had the same access to productive resources as men, according to the United Nations Food and Agriculture Organization. Productivity on women’s farms would increase up to 30 per cent. The number of hungry people would drop by as much as 17 per cent – an impact that translates into improvements for as many as 150 million individuals. The benefits would reverberate even further as these women’s children gain better access to health services, education and nutrition. We know how to achieve these gains: Invest in rural women. Eliminate discrimination against them in law and in practice. Ensure that policies respond to their needs. Give them equal access to resources. Provide rural women with a role in decision-making. These measures will help drive sustainable development – one of the great imperatives of the 21st century. As we prepare for the United Nations Conference on Sustainable Development, to be held next year in Rio, let us remember that rural women have enormous untapped potential to generate results. On this International Day, I call on all partners to recognize the contribution of rural women to our world, and to help them do even more for our shared future.